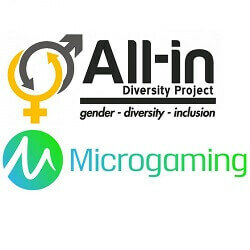 Microgaming, one of the world’s biggest and most influential online gaming operators, has recently become one of many to help found a new project called All-In Diversity, giving the project a strong support boost. They are joining other well-known companies such as GiG, IGT, and Kindred in a bid to try and make the gaming sector more inclusive. First established in 2017, the All-In Diversity Project is an attempt to try and both measure and facilitate a more open discussion about topics like equality, diversity, and an inclusion across the global gaming and betting sector. The project was formed by executives Christina Thakor-Rankin and Kelly Kehn, with the primary goal of the project being to create an entirely new standard index for the global gaming sector, becoming the new benchmark for future inclusion and diversity in the industry. Among other directives, the project aims to create annual reports on progress throughout the online gaming world, and using best practise recommendations to improve overall inclusion and diversity within the gambling market, and especially in areas where recruitment and equal pay are still generally unequal. Kehn has in turn welcomed Microgaming to the initiative, adding that the company will bring both knowledge and experience to the project.